From Dust combines a number of genres incorporating strategy, building and god games into one. The game was published by Ubisoft in July 2011 for the Xbox 360 with other platform releases becoming available several months later. Gameplay in From Dust is definitely unique and has players assuming the role of a god like character that controls the game world from the skies. Your job as this figure is to enlighten the nomadic tribe that lives on your island by using the tool sphere that you have at your disposal. This sphere allows players to master the elements of land, lava and water to create the world as they please. The game is split up into a series of missions which offer a variety of objectives for players to work towards. As you progress your village you will be able to access additional powers to help you move through the campaign. Most of these missions will have you protecting your village from an impending disaster in one way or another. 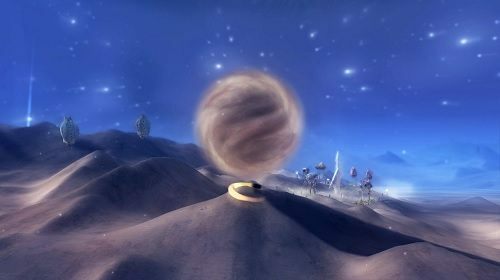 The final level in the campaign is more similar to that of a sandbox mode with players having free control of their tribe and the environment while having access to all the tools. Once you’ve mastered the story mode you can take up the various challenge missions which aim to be fast paced and more difficult while ignoring story all together. Physics play an important role in the game and help create a realistic game experience. You’ll find that lava flow, water and explosions all behave in a real world manner while also being visually impressive. From Dust ultimately is a quirky mixture of genres but has definite appeal to fans from many gaming backgrounds. The way you interact with the game world, interesting storyline and impressive physics help you forget that you’re playing a game and watching over people that don’t actually exist. Impressive physics bring the game world to life. Follow the story of the tribe in the story mode. Prove your powers in the challenge missions.